Finding the right Fairfax County Schools Rankings is tough. On the official Fairfax County Public Schools website (FCPS .edu), it is practically impossible to compare schools side by side. Not only that, but there are too many different kinds of rankings: Should you use SAT scores? Or SOLs? Or maybe The Challenge Index? With all the different rankings available (US News, GreatSchools, etc. ), how do you really know what the best schools are? To help you find the right school, we have compiled a single table with all the important rankings, and have mathematically created a single ranking for each school. 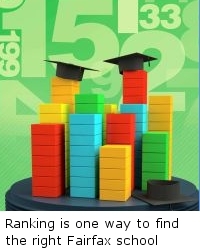 The Ultimate Fairfax County Schools Ranking© is one of the tools available on this website to help you find the right school. And once you find the right school, you’ll want to make sure that the kids can attend the school you selected (by living inside the attendance area of the school). If you want to be sure that the kids attend a specific school, the best way to ensure it is to live WITHIN the boundaries of the school (in the Fairfax County Schools district, the school assignments are very strict). Second, cross-referencing schools with available homes for sale that are INSIDE the attendance zones. To find homes for sale WITHIN the school boundary of your choice (not just a home near or close-enough to the boundary) can be very time-consuming and just plain frustrating— if you don’t have the right tools, that is. An interactive table with schools, 5 different rankings, plus their Ultimate Ranking. When you submit your information above, you will be taken to the Welcome page, and you will also immediately receive an email with your first downloads (rescue them from SPAM if you don’t see them right away).